It was a great honor. Your author was asked to preach the Presbytery sermon at the installation of the Rev. Dr. John Gerstner as an Associate Pastor of Trinity Presbyterian Church in Johnstown, Pennsylvania. The veteran pastor and theologian had just that year of 1990 joined the Presbyterian Church in America as well as the particular presbytery of which I was a member minister. I can remember entering with the other Presbytery ministers into the sanctuary, and there sitting in the front row, in the center seat, was Dr. Gerstner. A quick thought went through my mind as to what could I say which would edify the people of God, and Dr. Gerstner that evening? 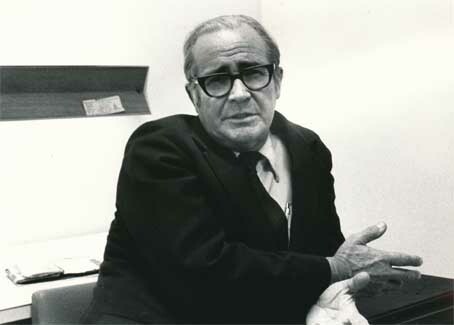 But just as quickly came the answer of which Dr. Gerstner in all his ministerial life had exhibited, namely, to preach the Word of God in all of its fullness. Born in Tampa, Florida in 1914, John Gerstner’s life and ministry would be spent in the northern states. Graduating from Westminster College, he followed that up with his Master of Divinity degree at Westminster Theological Seminary in 1940. Five years later, he would earn from Harvard University his Ph.D. degree. Overseas studies in England, Spain, and Switzerland would round out his education for the ministry. Ordained in the largest Scot-Irish denomination in America, the United Presbyterian Church, he served several churches in Massachusetts and Pennsylvania. But he would make his mark upon the Christian world and especially through those students who were privileged to sit under him at Pittsburgh Theological Seminary for more than 30 years. As an evangelical and Reformed professor in that UPCUSA graduate school, he provided a solid course of instruction for those evangelical and Reformed students who sat under him. One such student was R.C. Sproul. A careful look into the published works of the Ligionier Study Center will reward you with books and videos all written and spoken by John Gerstner. His primary work would be his three volume book on “The Rational Biblical Theology of Jonathan Edwards.” He became the authority on the life and ministry of this greatest of all American theologian. This author in two of his five pastorates had Dr. Gerstner as a special weekend speaker. On both occasions, he along with the people of God enjoyed a guest pastor who had an incredible intellect, a great wit, and always a pastoral heart. He entered heaven’s glory on this day, March 24, 1996. Words to Live By: The apostle Paul in 2 Timothy 2:2 states, “and what you have heard from me in the presence of many witnesses entrust to faithful men who will be able to teach others also.” (ESV) There are four generations mentioned in this verse: Paul, those who heard him, faithful men, and others also. It presents the goal of transmitting God’s Word to succeeding generations. John Gerstner accomplished this, as all those given the spiritual gift of teaching, are to aim for it. Pray for them to faithfully accomplish it. WLC 51 — “What is the estate of Christ’s exaltation? WSC 28 — “Wherein consists Christ’s exaltation? Image sources: Records of The Presbyterian Journal, Photo Collection, Box 246, folder 6. Scans prepared by the staff of the PCA Historical Center. Thank you for posting this memorial notice of the passing of Dr. Gerstner. He was a wonderful servant of Christ and a devoted teacher of the Gospel. He is still missed by all who profited from his instruction. Appreciate the Gerstner post. His teaching and preaching was memorial. My wife and I recently bought his home in Ligonier and cannot help but to think of him all the time we are there. He was a tireless worker, I can assure you, for the cause of Christ and His Kingdom.